Maintain biological diversity: avoid diseases and insect pests by fighting fire with fire. Do NOT use incecticides. Use bird seed to attract "insect removal squads." The better quality seeds will not contain grass and so will not start a weed problem. Wagner brand is excellent. Although good seed will minimize damage, protect plants that the birds seem to want to eat by encloseing them in nets. For smaller pests, buy ladybugs and release at night. For aphids on trees, use tangle foot because most aphids are farmed by ants inside "barns" made from leaves curled up by the ants. Use Milk to kill fungus or mold. Use diatomaceous earth to stop catapiliers and snails. Plant more than one crop in the same bed by finding good pairs. corn drives Carpophilus beetles from sunflowers, sunflowers protect corn from fall armyworms. corn meal is said to keep ants at bay. Combine tall, narrow plants with wide leafy plants to stop weeds. When planting broccoli in your garden, make sure that you practice good crop rotation since broccoli can leave behind residue that lettuce and cruciferous crops (cool weather vegetables and have flowers that have four petals so that they resemble a cross) cant tolerate. Anise and dill are said to make bad neighbors for carrots, but this hasn't been proven. Cucumber, pumpkin, radish, sunflower, squash or tomatoes close to potato hills. Tomatoes and potatos are attacked by the same blights, so when theyre right next to each other, the diseases spread more easily. Any member of the cabbage family near strawberries or grapes is trouble according to lore. Lettuce grows as a head or loose leaf. Unless youre aiming for a perfect head, you can continuously harvest leaves until the plant goes to seed. Kale grows taller and taller as you harvest leaves, and can last for months in the garden, offering an ongoing source of food. Celery is easier to store in the garden than the fridge. Simply use a knife to cut outer stalks as you need them. Green onions can be a source of flavor almost all season long. Just snip off the larger stalks and leave the more immature ones in place. Spinach and bok choy are two different kinds of greens that offer up the option of cooked or fresh greens. Simply cut the outer leaves as you need them. Purslane is considered a weed by many, but its a great addition to salads. Just snip off branches as you need them. Broccoli is a borderline cut and come again vegetable. Harvest the main head, leaving the plant intact and youll find that smaller side shoots develop. Cilantro goes to seed quickly, but its easy to grow. Harvest by simply cutting off stems a few inches above the ground. New growth will follow. Basil just keeps coming during the hot summer months. Pinch leaves off from the tips as you need them. Potatoes arent exactly cut and come again, but you can carefully dig under the plants to harvest small new potatoes before the plant is ready to be pulled and the potatoes harvested. Feed plants through the mulch: When soils are hostile to plant growth, feed plants by adding the fertalizer on top of the mulch. Rabbit dung is probably the best. Worm castings are great when available. Chicken poop is too hot, but goes well into the compost bin. Water from the bottom: Use tall, unglazed clay pots with a lid held on with a rock, or plastic milk or soda containers with holes punched in the bottom; buried in the bed with the top just above the mulch. Fill with watering can or use drip irrigation tubes. Roots will grow down to reach the water (rather than along the surface) reduceing compitition and allowing dense planting. Also, the deep soil has minerals and retains water so plants are less likely to dry out. Also, you need less water and weeds on the surface will not start. If you don't till the soil, the surface can be covered with weed seeds and nothing will grow except your plants. Check this out! http://pathtofreedom.com/peddlerswagon/garden/water%20savers/olla/olla-pumpkin.shtml An ancient watering technique that conserves and delivers water direct to the roots. The use of buried earthen jars for watering plants has been used for thousands of years. The hand-thrown unglazed pot is buried neck deep into the soil, fill the pot with water and it slowly seeps into the soil to be absorbed by surrounding plants (not for use around wood plants such as shrubs and trees) Designed from nature, handmade in the USA. You can get contiuous production by planting one new row of seeds every week or three. Plant close together and thin by moveing or eating overcrowed seedlings. Lettuce / spinach / etc... will continue to produce if you peel a few leaves at a time from the outside of each plant. Free eggs! My families success! http://seawatergreenhouse.com/process.html Seawater is evaporated at the front of the greenhouse to create cool humid conditions inside. A proportion of the evaporated seawater is then condensed as fresh water that can be used to irrigate the crops. Excess freshwater created in the Seawater Greenhouse can be used to irrigate additional crops grown outside the greenhouse. The air going into the greenhouse is first cooled and humidified by seawater, which trickles over the first evaporator. This provides good climate conditions for the crops. As the air leaves the growing area, it passes through the second evaporator over which seawater is flowing. This seawater has been heated by the sun in a network of pipes above the growing area, making the air much hotter and more humid. It then meets a series of vertical pipes through which cool seawater passes. When the hot humid air meets the cool surfaces, fresh water will condense as droplets that run down to the base where they can be collected. The cool and humid conditions in the greenhouse enable crops to grow with very little water. When crops are not stressed by excessive transpiration, both the yield and the quality are higher. The simplicity of the process imitates the hydrological cycle where seawater heated by the sun evaporates, cools down to form clouds, and returns to the earth as rain, fog or dew. 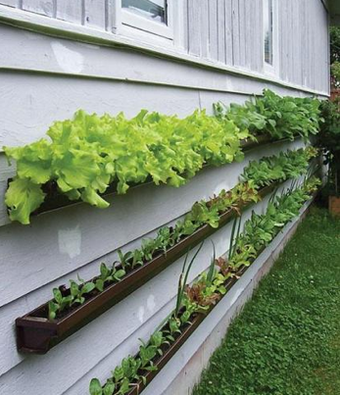 http://lifehacker.com/5229896/gutter-gardens-grow-produce-without-taking-up Planting shallow root crops in a standard rain gutter mounted to the side of your house conserves space, keeps the pests out of the crop, provides some temperature stability and protection from the wind. Try to find unpainted copper or stainless steel gutters, or line them with food safe rubber or plastic. Make sure they are mounted absolutly level to keep water from pooling at one end, or use a layer of sand at the bottom to wick the water evenly. Since there is very little soil to hold water, regular attention will be required to keep them from drying out. Gutters can also be mounted to a line of stakes for a vertical garden away from a wall, but watch out for over watering from rain. Drain holes near the bottom of the gutter may help, but again, there is little capacity for holding water, so drainage will increase the need for watering between rains. http://www.attainable-sustainable.net/growing-carrots/ Seed your row of carrots and water them in well. Place a 1? x 4? board over the row. Thats right, right on the ground on TOP of the row of newly planted seeds. Check on the row daily as you water and as soon as you see sprouts, place bricks under each end of the board so that its not directly atop the new sprouts, but still shading them. Once the seedlings are tall enough to touch the board, you can take it away. Keeping the seeds moist and shaded as theyre getting situated in the garden is the ticket. http://www.fastonline.org/CD3WD_40/CD3WD/INDEX.HTM An AMAZING volumn of information on the subject of food. http://www.davesgarden.com subscription site but very nice. $15/year or $5/bimonthly as of 2003.09.30 Some christian bias. http://www.allwoodwork.com/tips/potatotower.htm Each time your potato plants show leaves, raise the sides of the bed about 6 inches and bury them again. Repeat 4 or 5 times then let it grow till harvest time. Each layer of leaves will produce more potatoes. Fertilizers: seaweed, sludge, bone meal, blood meal, cottonseed meal, soybean meal, transplants, manure, sulfur, fish meal, rock powder, lime, gypsum, compost, guano, worm castings, Sul-Po-Mag, alfalfa meal, limestone, rock phosphate, oyster shell lime, banana peels, egg shells. Natural Insecticides: neem, pyrethrum, citrus rind, flour. Beneficial insects: (insecticides) bats, snakes, bees, lizards, birds, wasps, frogs, ladybugs, lacewings, flies, bumblebees, butterflies, toads, milky spore, beneficial nematodes, Bt, praying mantis, barn owls. Compost: hulls, bagasse, coffee, food waste, newspapers, sawdust, grass, leaves, tree trimmings, gin trash, cotton burs, manure, sludge Vermicomposting. Mulches: compost, hulls, hay, sawdust, leaves, straw, newspapers.